The turkey has been eaten and now it is time for the Christmas Tree to go up! This time of year goes by fast so let us enjoy every minute of it. Young Living makes an essential oil blend called Christmas Spirit Essential Oil and it is of course my favorite to diffuse right now. Let me tell you what oils it contains and why you may want it at your house this season. Orange – uplifting and alleviates anxiety & depression moods which are common right now. Cinnamon Bark – boosts brain activity including reducing tension. Yep that tension again. Spruce – is calming and smells just like your Christmas Tree, right? Each of these oils are great on their own, but the blend is just FAB! You can order any time of year or stock up for the perfect stocking stuffers. Visit my post Why Young Living essential oils for my family or Young Living Details explained here. 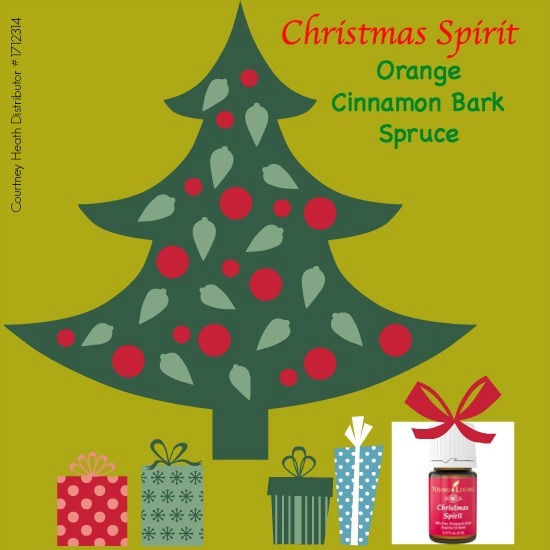 WIN a Christmas Spirit Essential Oil for any reader! Yes, they are. My family loves essential oils. essential oils are always on my wish list, would love to try some ones I haven't tried yet. I have been looking into essential oils for about 6 months now. I am having a hard time trying to determine the difference, if there is a difference, in the different companies that sell it. Particularly Young Living and DoTerra. Just wondering if you ever looked into the other companies and what made you pick Young Lliving. There are a couple of other companies too that I am checking into and it can get a little confusing. Thanks for the giveaway!! yes I will send you an email! I am longing for Rose, 3 Wise Men, and Sandalwood EOs. Just thinking about that cinnamon bark made me smile. I just love that smell! I really want to get into essential oils for health and stress relief. Essential Oils are not on my Christmas list, they are like having groceries around my house! Thay are wonderful for so many things! I think I am going to add them to my wish list, these are new to me and I am interested in learning more about them. There are quite a few essential oils that I use on a regular basis, they can be really useful for a number of things. Thank you. Yes I would love some essential oils. Yes! I would love a nice one for Christmas. I love the smells of pine/spruce and cinnamon, and always look for ways to make my home smell like that, but most are chemical filled and not good for your health. I would love to try this blend. i am a distributor. i love christmas spirit! Yes, I have some , but I would like more variety. I always want more essential oils. The more I learn, the more I want them. I am building up a small stash. Eucalyptus, Lavender, Peppermint and Citrust and the ones I use most often. I've been reading more and more about essential oils and I'd really like to try them. Thank you for the chance! I definitely have essential oils on my list this year. I'm low on all of my favorites. I like essential oils when I smell them in places. I would like to try them in my own home. Yes! I love essential oils! Ohh they sure are I love essential oils!! I've never tried this one so I would be very interested. I love my yl oils really hoping to win this set since I do t have any of these! I'd love to have this to put in my diffuser. No oils are on my wish list because I have so many. Thanks for the contest. I love to use essential oils like lavender for a nice calming bathe, so yes I would love to receive some for Christmas. Essential oils aren't on my wish list, but I enjoy using them. Yes, I really want essential oils for Christmas. I just started using essential oils this past summer. My supply is very small. I would love to add these to my collection! Essential oils are always on my wish list, right now I'm looking for essential oils for repelling bugs. I would love it if I received essential oils! I use mine daily! It's on my wishlist! Maybe we will get a bonus this year again and I'll be able to swing the starter kit! I've been looking into essential oils. There are a lot that I want to try! Thanks for the chance!! Yes, essential oils are always on my list! I love essential oils, I've been looking for a good rose one. I need more Thieves and I would like Rose eo for Christmas! I love essential oils! I could definitely use some more to expand my collection. yes, I have a blend I use for sleep and I'm almost out so time for more! Yes, I love essential oils. My favorite is eucalyptus. I love using essential oils. My favorite is peppermint. I just love the smell. Yes! They're definitely on my wishlist... I'd really love a sleep blend. I love and use essential oils daily. I never thought about adding them to my wishlist but would love to get them in my stocking. These oils are perfect to get my home smelling seasonal! I love lavender so I would buy it too. I am a fan of aromatherapy. I know scents help me a lot. My wife would love to get lavender. Essential Oils are a must in my house. I love using lavender mostly but vanilla is nice too. They are on my list! Thieves is on my list. Love to diffuse essential oils! Nope, they are not on my list because I buy them through the year. I always have essential oils on my wish lists. They are AWESOME!!! Thank you for the chance! Essential oils are always on my wishlist!! I love expanding my little collection! <3 Merry Christmas! Essential oils and a diffuser are on my Christmas wish list this year! im working on the humidifier first,lol. then i will get oils. but i have them saved in carts, just waiting on the cash,lol. I have collected essential oil for years. My favorites are: lavender, bergamont, peppermint and lemon. I have been using essentials oils on and off for a couple years. My favorite is Frankincense and it's definitely on my wish list. Yes! I'm dying to try them, I keep reading about how amazing they are! Thanks for the chance! this sounds like it would smell so good!! Yes, I love essentials oils but don't have too many just yet. They are always on my wishlist. I love to use essential oils. I particularly like Lavender and Lemon. I have wanted to try essential oils for a long time. My mom uses them and loves them. I just haven't had the money to try them yet! I'd like to have Peppermint essential oils. Peppermint oil is on my list... perfect for the holidays! I've never tried essential oils before so I have been wanting to!